The country wants level 3 autonomy within three years. South Korea has just opened the first section of its 323,749 square meter (3.45 million square feet) self-driving car testing facility. The testing grounds, known as “K-City,” are located approximately 32 km (20 miles) from the South Korean capital city of Seoul. A report from the Korea Herald states the facility includes “highways, downtown areas, city outskirts, and communal environments,” — a design that hopes to accurately simulate real-life conditions for self-driving cars. The first section to open is the four-lane highway, and the full facility is expected to be operational by late 2018. 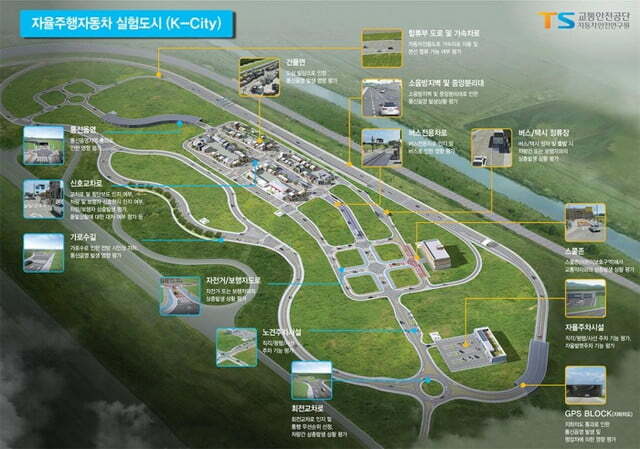 The grounds could also be used to test cars built by Samsung, SK Telecom, Hyundai, and Kia Motors. South Korea is looking to make a mark in the realm of self-driving vehicles. The country is hoping the highway opening will support the government’s plan for commercial availability of vehicles with Level 3 autonomy within the next three years. The largest such testing facility in the U.S. is Waymo’s “Castle” which covers 404,686 square meters (4.3 million square feet) of Californian desert. The University of Michigan is also working to build an even larger testing facility on the grounds of a former General Motors aircraft plant in the Michigan city of Ypsilanti. The facility is set to open next month and will cover nearly 1.4 square kilometers (14.6 million square feet). These facilities will play a major role in preparing self-driving cars for real-world deployment. Data collected from these tests help ensure the vehicles are safe before they hit the road. The University of Michigan is also working on developing a new approach to test autonomous cars with impressive rapidity. The ability to couple tangible reality-simulating facilities with high tech approaches is sure to help self-driving cars develop into the life-saving devices they have the potential to be — and in the shortest amount of time possible.